“What is essential is invisible to the eyes”. That heartfelt message exploded from the stage at Theatre Calgary Friday night where The Little Prince received its World Premiere. The musical is based on what is arguably one of the most popular children’s books in the world, with sales totaling over 140 million copies worldwide. It’s an ambitious story to tackle, both because of the imaginative nature of the fable and the beloved quality of the story. Thankfully Nicholas Lloyd Webber, James D. Reid and Dennis Garnhum were up to the task. The classic story that was designed for children but ‘written for adults’ examines the nature of the human mind and heart, and our desire to find our place in the world. It is a allegorical tale if ever there was one, told through the magical world of the Prince. 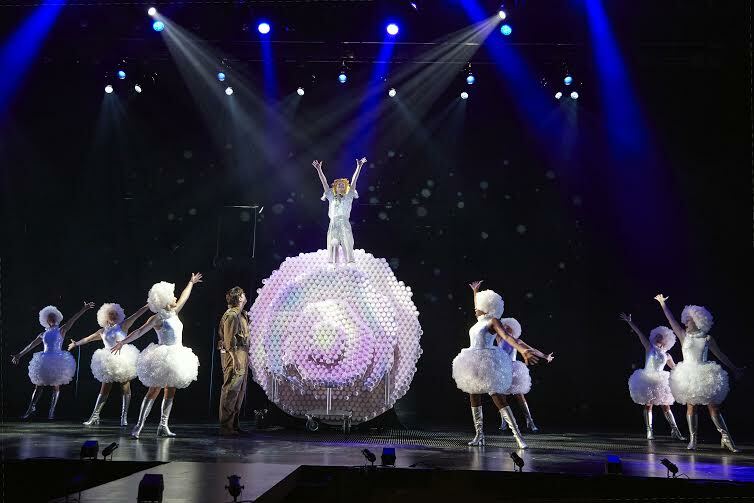 The production demands much of its audience – insisting that you utilize your own imagination to see beyond what the eyes think they perceive. The reward for this exercise is the ability to swiftly become enveloped in the Little Prince’s world. The show begins with a pilot (Adam Brazier) crash landing in the Sahara Desert and stumbling upon The Little Prince (Sarah Caraher). The Prince has journeyed to Earth after leaving his asteroid in order to explore the solar system and find his ‘true friend’. They are quickly approached by a Snake (Louise Pitre) who makes a deal to return The Prince to his Asteroid and tasks The Pilot with keeping track of the young boy. The Prince recounts his long and arduous journey to the Pilot, including the story of his great love The Rose (Elicia Mackenzie) who he left behind, and the other giants of the solar system whom he met on his travels. As we journey with the Pilot and learn of The Prince’s travels, we recognize that although he is a young and innocent child, he is exploring the bigger issues that are so prominent in life and yet difficult to tackle. His love for The Rose is strong but difficult, challenging The Prince and pushing him away at the same time. The rulers of the other planets highlight the nature of grown-ups to incorrectly perceive their world. There is the Businessman with no employees (Kevin Forestell), the geographer who has never explored (Joe Matheson), the drunkard who is drinking his problems away (Julio Fuentes), a King with no subjects (Justin Raisbeck), a conceited man who believes himself to be the most important person in the solar system (Andrew McAllister), and finally, a sad lamplighter who goes round and round lighting and extinguishing his lamps (Alexnader Nicoll). The Prince quickly points out that it seems very sad to be a grown-up, and continues on his journey. Lloyd Webber and Reid’s musical numbers are sweeping, tugging at the heartstrings and providing fuel for the magic that is happening on stage. Songs such as “Forty-Four Sunsets” instill feelings of hope and love, and glitzy production numbers like “Welcome To My World” provide moments of awe that one would expect from a story set among the stars. The set is simple, again demanding that its audience focus on using their hearts and imaginations to flesh out the story. While I love the basic approach to force the use of imagination, at times it felt too minimalist and certain moments could be improved to avoid taking the audience out of the story. For example, when The Prince climbs the mountain the creative use of lighting and ensemble members is lost when a tech has to come on stage to help The Prince ascend. That said when the larger numbers come together it is stunning to watch. The Lamplighter’s number is a circus inspired delight, and “The Mountain Echo” utilizes the audience to provide one of the most stunningly inclusive moments I’ve felt in a theatre in a long time. All of this would not be possible without the talented cast who are pouring their heart and soul into the story each and every night. Elicia Mackenzie’s Rose is heartbreaking, and provides a stark contract to Louise Pitre’s sinister Snake. A villainess to the core, she commanded the stage whenever she entered and “The Riddle of The Snake” was humorous, dark and vocally charged. Adam Brazier’s Pilot was a nuanced portrayal of a man who is lost, both literally and figuratively. It is easy to identify with his struggles and root for him to succeed, and his final number “Water For The Heart” blew the roof off the theatre and gave definition to the term eleven o’clock number. Finally there is Sarah Caraher’s The Little Prince. Her diminuitive stature and childlike mannerisms were perfect for the role, and her interactions with the various characters along her journey were genuine and a delight to watch. She has a beautiful voice well suited for most of the score, the only exception being a few of the higher pitched songs which sounded like a struggle (and thus became difficult to understand). In the end, I feel The Little Prince was worth the wait. This show has been a long time coming, and I felt both proud and excited to see it presented with some of this country’s premiere musical theatre talents. The Fox reminds us that “One sees clearly only with the heart”. Check your cynicism at the door and watch The Little Prince with your heart – you won’t be disappointed.